Wordless Wednesday: Prince Levon Valentine Thunder Finch. Malou, " I'm not sure if you know this but I am the "Squeaky Wheel" aka "The Informer" in the cottage." Malou, " I'm the first to pipe up if there is something new to report to anyone. But lately, there truly is no new tale to tell! " Malou, " I guess I should mention that cherry blossoms have been placed in various vases throughout the cottage. The cherry trees are in bloom now in Vancouver. Cherry tree branches are heavy with blossoms that line the streets. It is very pretty!" Malou, " And yes, I do like to eat the flowers and then spew the undigested bits all over inconvenient places such as the tablecloth or light coloured carpeting. I guess that's something to report. I'm going back to my bird watching now. I'll let you know if something better comes up!" Walking amongst the flowers with Esme. Esme , " I am lying in the sun on the table." Esme , " I am here amongst the tulips and violets ." Esme , " In my mind , I am on flower patrol. " Esme , " These violets need watering !" Esme , " What are all these fallen petals doing here? Is it time to replace the tulips?! Someone needs to clean up this mess!" Esme , "Sniff. Sniff. Hmmmm. Fallen petals still hold their fragrance. How lovely." Esme , " I like to walk through and amongst the table flowers on flower patrol. For me , it is a joyous thing." A Snuggly Friday and weekend with Levon. Levon , " Peek-a-boo! I am in my snuggly hammock." Levon , " I see you but I see something else too! " Levon , " It is a flutter of light . . . "
Levon , " Or a whisper of wings . . ."
Levon , " It is a moving wisp of air . . . "
Levon , " It is something I see but you can never see." Levon , " There IT goes. " Levon , " That was tiring! I need to nap now in my snuggly hammock on a snuggly but rainy Friday.Zzzzzzzzz." Have a Fabulously Snuggly Friday and weekend! Here Today, Gone Tomorrow with Mitalee. Mitalee , " It's Spring and I am lying in partial sun on my favourite scratcher." Mitalee , " The thing about Spring in my opinion , is that the weather is a bit faulty." Mitalee , " One minute I am lying in a pool of sun, the next minute I am lying in the sun's shadow." Mitalee , " Spring sun is like a fairweather friend ; here today , gone tomorrow!" Mitalee , " The sensible thing to do is to enjoy it while it is here! I plan to do just that today! Zzzzzzzzzzzzzzz." Update on Easter Toys with Levon. Levon , " I wanted to let you know how we did with all our new Easter toys." Levon , " Do you see the pink , glass egg hanging from our Easter tree? Malou and I managed to bat one around that looked exactly like it , then watched it break into smithereens below us when it fell off the tree." Levon , " But wait! Before you begin to judge us unfavourably. . . LP broke TWO of these lemon coloured glass eggs trying to hang them onto the tree! She says she suffers from " dropsy" but we know she just made that up. She is a Butterfingers is what she is! " Levon. " Butterfingers also broke the mate to the coloured daisy egg you see at the bottom right corner of this photo." Levon " We did not harm any of the butterflies on the Easter tree! " Levon , " Nor did we harm the headless chick to my right." Levon , " These paper carrots were also left alone." Levon , " Let's tally it up ! Malou and Levon = 1 cottage casualty for the entire Easter holiday! Butterfingers = 3 cottage casualties this Easter! I think Butterfingers has the potential to catch up with me and Malou's overall cottage casualty scores if this keeps up! " 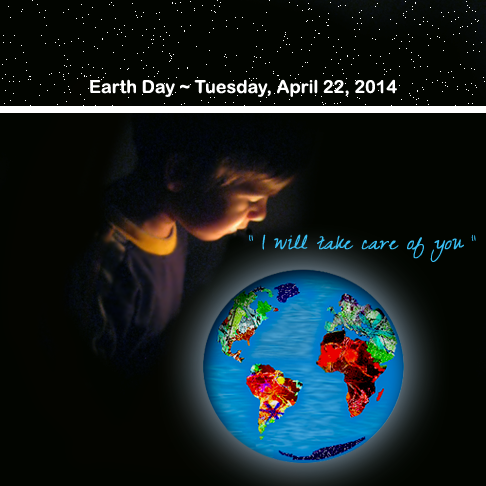 Esme , " Today is Earth Day. A day to remember our three R's." Esme , " Reuse , Reduce , Recycle." Esme , " Once when I was kitten and didn't know any better, I threw some litter on the ground. Mama Cat said , " When you throw litter on the ground it doesn't seem like such a big thing, but if everyone in the world also threw some litter on the ground , how would we ever see the ground? Or the trees? Or the flowers? 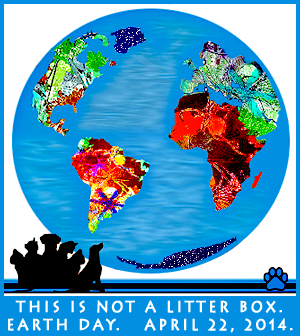 Everything would be covered in litter. Always do the right thing and others will follow." Esme , " Mama Cat was right. " Esme , " When a lot of us decide to do the right thing , all the wrong things we do to our Earth , can be righted." Esme , " Earth , everyone at the cottage practices the Three R's on account it is so important to all of us and to all who come after us. We will help take care of you."